Multi-Format HD Video Switcher. 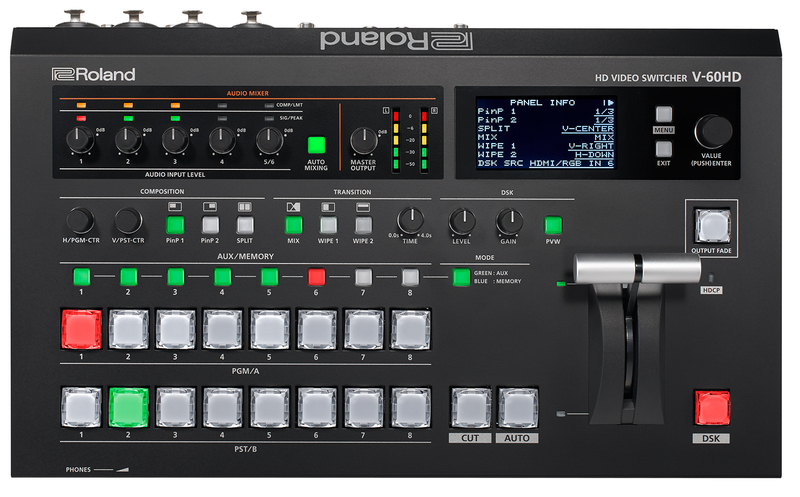 Plug-n-Play Production Switcher with Audio for Live Event and Production. Not all cameras support full 1080p so the de-interlacer on the SDI inputs allows you to mix and match 1080i and 1080p SDI video sources multiple camera without external converters. The V-60HD includes a DSK (downstream keyer), Picture-in-Picture (PinP), Split composition effects ideal for creating news style broadcasts and corporate presentations. PinP window shapes include rectangle, circle, heart and diamond patterns to add a special touch to special events. The DSK can be used for overlaying titles, song lyrics, logos or graphics coming from the video sources with up to three layers of composition. The DSK supports both Luminance Keying (Black/White) and Chroma Keying (Blue/Green) for compositing two video sources plus the additional layer of PinP plus your background video ensuring creative live production environments. V-60HD can preview all six video inputs and two still images, PGM and PVW to a single preview monitor via the Multi-view output. In addition, you can display the menu on the Multi-view display, so you make setting changes without changing your focus from the preview display.